Enter the following code into an editor in python. [Q2] How is the output from this code different than the output from the previous code? The first shape we make today is a simple row of stars. Write a program that you will save in a file called starLine.py. Upload the files to their proper locations. Modify your previous code to use nested loops so that it prints out mulitple lines of stars, which happen to look like a left-justified right triangle! Write a loop around your previous loop code to run it multiple times with different numbers of stars. Your code should prompt for a positive height, and re-prompt if a positive number was not entered. Hint 1: The height is the number of times the outer loop should run. Hint 2: The inner loop prints out one line of stars, starting with one star on the first line and incrementing the number of stars by one each time it runs. Each line is actually a mixture of spaces and stars. 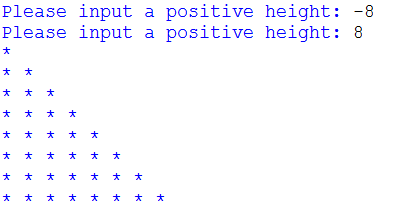 [Q3] How does the height of the triangle relate to the number of spaces and stars printed the first line? On the second line? [SIG3] Please show rightTriangle.py to an instructor. Don't forget to hand in your answer sheet to the professor or TA before you leave!